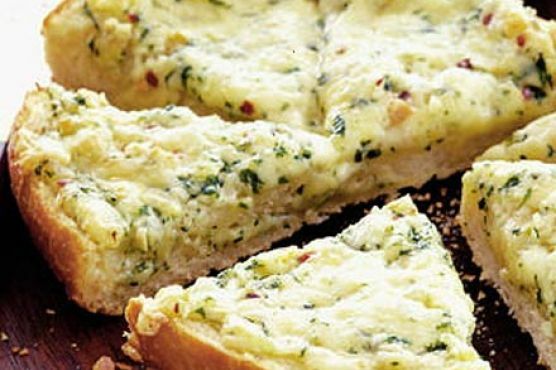 Cheesy garlic bread wedges might be just the hor d'oeuvre you are searching for. This recipe serves 12 and costs $2.51 per serving. Watching your figure? This gluten free and primal recipe has 1724 calories, 148g of protein, and 122g of fat per serving. If you have butter, round country loaf, parsley, and a few other ingredients on hand, you can make it. 102 people found this recipe to be flavorful and satisfying. From preparation to the plate, this recipe takes approximately 45 minutes. It is brought to you by BBC Good Food. With a spoonacular score of 95%, this dish is great. Try Best Ever Cheesy Garlic Bread, Cheesy Garlic Bread, and Cheesy Garlic Bread for similar recipes. Sparkling rosé and Sparkling Wine are great choices for Cheesy Garlic Bread. If you're serving a selection of appetizers, you can't go wrong with these. Both are very food friendly and complement a variety of flavors. One wine you could try is Bellissima Sparkling rosé. It has 4.5 out of 5 stars and a bottle costs about 24 dollars.